Still digesting Thanksgiving dinner? Nothing like a double hopped IPA to wash away the Pumpkin pie from your palate and shake you out your tryptophan induced slumber. In this round we pair up two variations on the basic IPA style, a double IPA against a wet hopped IPA. Bodhi by Columbus Brewing Co. (Columbus, OH) – Bodhi is a term used in Buddhism, to mean awakened or enlightened. Columbus Brewing promises that this ode to hops will awaken your senses, and I have to agree. On the BeerAdvocate.com list of the top 250 beers in the world it is the highest rated Ohio beer, coming in at #102. It’s not bottled but you can get it at better bars and growler shops in the Columbus area. In fact this beer is the reason why I bought my first growler bottle several years ago. Its vital statistics are 8.5% abv and 93 IBUs. 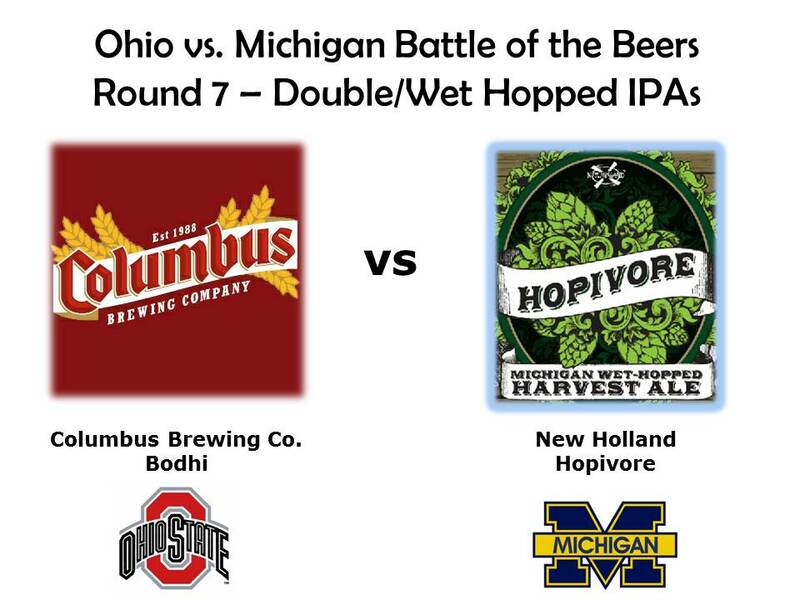 Hopivore by New Holland (Holland, MI) – Finding a suitable Michigan beer to matchup against Bodhi is challenging. I think the most comparable beer would probably be Bell’s Hopslam. That would be a great contest, but Hopslam is released in late winter and thus not available in November. (Good idea for a taste test in late February though). I considered Founders Double Trouble, which is still on the shelves, but probably past its prime. Bell’s Oracle is another possibility, but I had some of that a few weeks back at the Studio 35 Beer Tasting and while good in my opinion it doesn’t match Bodhi. In the end I decided to go with a batch of the New Holland’s wet hopped IPA, Hopivore that had just hit the shelves the week of the tasting. Fresh grown, just harvested Michigan hops are added to the beer as it ferments. It is listed at 5.5% abv and 55 IBUs. Bodhi has a hazy pale, almost golden, yellow color. As you bring the glass to your face the hops hit you in the nose with tropical and citrus fruit aroma (oranges, grapefruits, …) along with a lesser but not insignificant amount of pine. The glorious fruity hops are front and center in the taste as well, supported by a rather sweet malt base. The beer has the resinous, oily feel you expect from a double IPA. There is some bitterness on the finish, but not as much as you would expect for a 93 IBU beer that dials the hops up to 11. The only flaw I can find, and this is a small one, is that the malt base is a little on the sweet side for my tastes. This summer I was lucky enough to visit the Russian River Brewery in Santa Rosa, CA and bought several bottles of their acclaimed Double IPA, Pliny the Elder. I didn’t get a chance to drink Bodhi and Pliny side by side, but if I did I think these two beers would be hard to tell apart (if anyone has done a side by side tasting please leave a comment here to enlighten the rest of us). Unfortunately I don’t have too much to say about Hopivore. For some reason I didn’t take notes on it at the party, I don’t say too much about it in the video, we didn’t have any left over, and frankly speaking it isn’t good enough to justify buying more. The lack of detail stems from the fact that this beer does little to distinguish itself. The one thing I can say for sure is that I was totally underwhelmed with the aroma. I’ve had several wet hopped beers this fall including Founders Harvest Ale, Sixpoint’s Autumnation, and Columbus Brewing’s Fresh Hop Ale. The fresh, green hop and grassy aromas together with the juicy flavors of these beers make them one of my favorite styles. Hopivore didn’t have any of that going on, it was just a garden variety IPA. This was no contest from the start. A beer that makes a strong claim to be called the best beer in Ohio against a disappointing beer that really doesn’t deserve to be called a wet hopped ale. On a 1-10 scale I give Bodhi an 8.5 and Hopivore a 4. The numbers are in and Bodhi is the winner in a landslide. See the video above for the people’s pick. Here I’m joined once again by Ted. We sing the praises of our new Bodhi enlightenment, babble on a bit about sports mismatches, and then count the ballots. When the dust clears, the credibility of half of the poll voters drops to the level of the International Olympic Committee. WARNING: If you are an IPA lover you might find this video disturbing.